Dayton received a Bachelor of Science degree in Animal Science in 1977 and a Master’s Degree in Entomology from the University of Tennessee in Knoxville in 1980. Dayton's Pest Control is your trusted source for pest control needs. Dayton & Sheila Hylton locally own and operate the business, and proudly served Knoxville and surrounding counties since 1985. Dayton's has always been a leader in adopting new technologies to make pest and termite control safer and more effective. Very happy with the service. The technician was helpful & very good. Dayton's pest control did an excellent job of eliminating the termites. Jeff was punctual and efficient for our termite inspection warranty visit, and a year after the treatment -- which is still working -- he recalled being one of the DPCS treatment team at our house. A nice surprise to have that continuity. He knows his stuff and does it with a good attitude, even toward our watchgirl Bella! Blake did a good job. We haven't seen anymore ants. He was friendly and very informative. Excellent crew was sent to do termite and encapsulation of our home. They were courteous and professional in their services. Highly recommend Dayton’s! I have been using Dayton’s for years. I have always found their personnel to be true professionals. They call before coming, arrive on time and do quality work. Whenever I have had an issue, they have been quick to respond. They are good people with an excellent track record. Fast, friendly and professional work. Technician explained services provided and took the time to answer any questions we had. Will definitely use them for any service needed in the future. Great customer service and prompt response! Great service and prices with quick follow up service when needed. Absolutely love this company! Their entire team from office staff to technicians that come to my home are always friendly and take the time to personally give me a courtesy call to remind me when they will arrive. Thank you for your service! The fine folk at Dayton’s are prompt, thorough, and proactive. We have used their services for years and years and have always found them to be professional and reasonably priced. If we retire and leave town, we are going to take Dayton’s with us. Sorry, Knoxville. The folks at Dayton's are professional, knowledgeable in their field and accommodating. They are happy to answer any questions you may have and prompt about rectifying any problems. Extremely reliable service. Michael was here on time. He was very informative and helpful. We will follow up after 90 days just to be sure the problem is resolved but the initial service was excellent. Jeff was very professional,Friendly and polite this is a employee that gives a company a good name. if i know of anybody needing a inspection i will give them Dayton's phone number. Great and friendly service as usual. We have used Dayton's for more than 30 years and have always been pleased with the service and value. We live in very old home and have chronic issues with mice and bugs. Dayton's helped get them under control and continues to prevent a reoccurrence. Their staff is professional and friendly, and their rates are quite reasonable. When they say they will do something, it always gets done. We will not be using anyone else for our pest control needs. Wonderful experience will all our service calls and we’re spoiled now! You have by far exceeded all our expectations and we thank you for continuing to provide the best service we’ve ever had with any pest control company. J and J.
Dayton's is the best. Great people and great service. Very knowledgable and professional. A great company to work with. with any problems we are having. 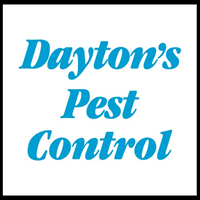 We have been using Dayton's Pest Control for several years now, and we love their professionalism. They are always prompt, and we are always pleased with our service. I am Very Happy with Dayton customer service & technicians. Excellent inspector, explained every thing he was doing and what he was looking for. He instilled confidence in the service he was delivering and for Dayton’s Pest Service overall. Will always calls to let me know when he will be out to do his thing. I have always been impressed with the courteous, professional attitude of all the technicians who have come to inspect my property. Crew came in quickly completed the treatment cleaned up and let me know they were leaving. Good job! Two regular pest services so far very good. Company is prompt, dependable and communicate very well. Quite pleased thus far with Dayton. John G.
Technicians are always on time & pleasant to work with. In the past, when we've had water in the crawl space they've been proactive to notify us of the problem. We've had Dayton since we broke ground on building our home back in August 2001. Great people to work with!! Super great and nice people! Very professional and friendly. Great professionals !! The service is excellent !! Always the best service! I have used Daton's for years. Never had any reason to complain! They always go above and beyond.